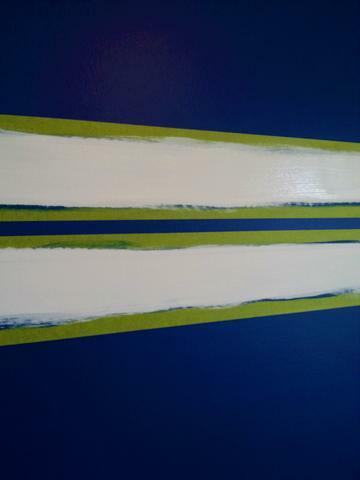 I paint stripes in my wall murals all the time and they look fab if done right. I LOVE sharing painting tips with my fans and I think this tip is one of the easiest (and one of the most needed) tips for making a “Wow!” wall. So…have you ever walked into a room with striped walls, saw the totally imperfect paint line and made like you loved the room? 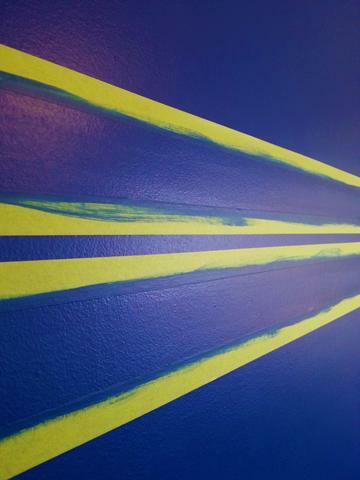 The paint seeped under the tape and now the should-have-been-crisp paint line is blotchy, splotchy and ugly. Ewwww! Here’s my step-by-step tutorial on how to paint stripes on a wall and get a perfect, crisp paint line. Obviously, you need to paint the wall in the base colour first. In my photos, that would be the navy blue wall. 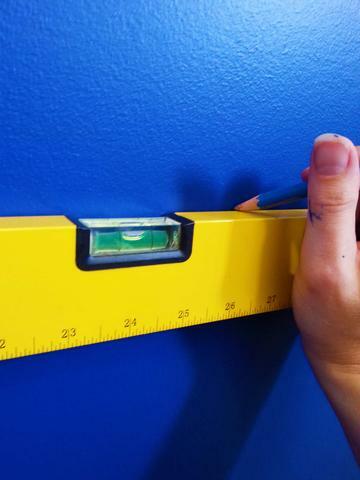 Use a level and draw a line in pencil so you’re sure of a super straight stripe. Stick green painter’s tape on the wall, using the pencil line as a guide. Put the tape just above and just below the pencil line, so that when you paint the second colour (white in my pics), you’ll cover the pencil lines. There’s nothing uglier than a gray pencil smudge on your freshly painted wall. Yuck! 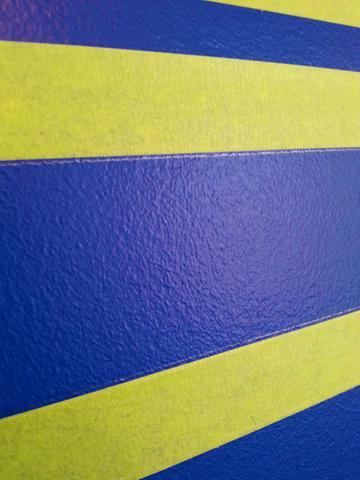 This is the top secret tip that makes crisp striped walls. 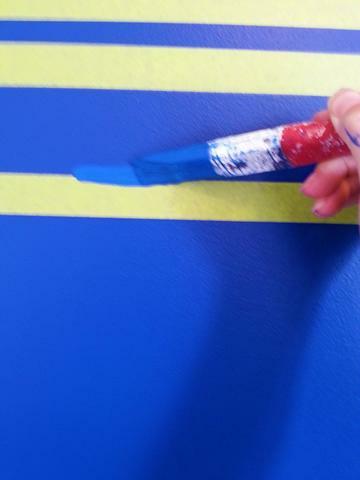 Use the original base colour (blue in my pics) and paint over the inside edge of the painter’s tape. I usually do two light coats before painting the second colour. 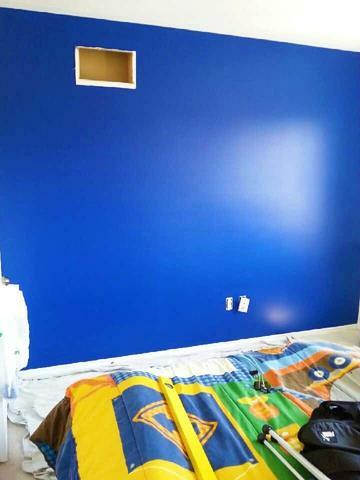 If any of this blue paint seeps under the paint, it’ll blend right into the rest of the wall. Yup, that’s it. Paint the second colour now (white in my pics)…it can’t seep under the tape because it’s been sealed. Remember to let the base colour (blue in my pics) dry before painting the second colour, so you don’t end up mixing two colours together. Eek! This is my fave part of the whole process. It’s like striking something off my to-do list. It gives me a gooey feeling inside. Oh ya, baby! Peel it off slowly so the tape doesn’t rip and make it harder to peel off. 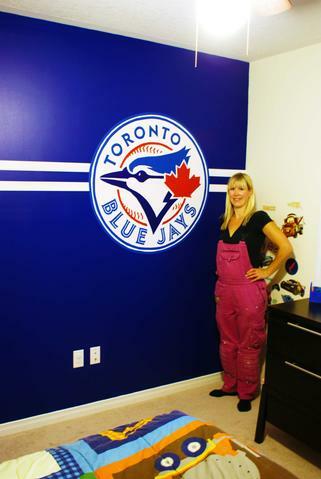 Here are some perfectly striped walls along with a Toronto Blue Jays baseball mural I hand-painted for a little boy in Binbrook, Ontario. 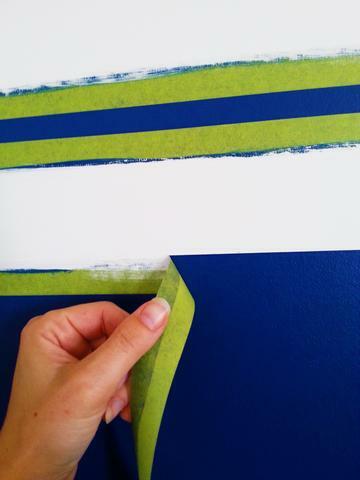 Do you have a secret trick to painting perfect wall stripes? Did you try my tip? I’d love to hear your stories or see your pics. Let’s talk in the comments below!